Courtyard by Marriott Waikiki Beach, a Honolulu Hotel, welcomes visitors who come for top Oahu Events in March. The Honolulu Festival and the St. Patrick’s Day Parade are just two examples. 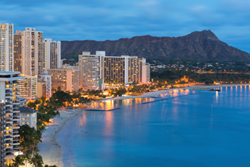 Courtyard by Marriott Waikiki Beach has impressive special offers to welcome March visitors. This free Oahu event includes more than 100 performances, great food, hands-on crafts demos, and much more. Attendees will enjoy singing, dancing, and cultural offerings. Craftsmen will sell their wares, and there will be plenty of chances to learn about various cultures represented at the Honolulu Festival. This event is appropriate for all ages, and it attracts participants and attendees from around the world. Hawaii loves parades, and this Oahu event is one of many that take place throughout the year. Some visitors may not think Hawaii would be the place for a St. Patrick’s Day parade, but many Irish have called Oahu home since the late 18th century. Parade goers start arriving early to get the best viewing spots, so spectators hoping for a front row spot should arrive well before the start time. The parade, which will be the 49th St. Patrick’s Day Parade on the Island, usually begins at noon and marches from Fort DeRussy to Kapiolani Park. In celebration of Black History Month, the Honolulu Museum of Art will host the African Film Festival in its Doris Duke Theatre. A selection of films made by and about African Americans will be featured through March 4th. A list of films being screened at this Oahu event is available on the Museum’s website. Those planning a March visit can make reservations at Courtyard by Marriott Waikiki Beach by visiting the Honolulu Hotel’s website or by calling 877.995.2638. The Oahu accommodations at Courtyard by Marriott Waikiki Beach give every guest the chance to experience all the best that Oahu has to offer – all within a short distance of this conveniently located Honolulu Hotel. Courtyard by Marriott Waikiki Beach is just a few steps from the world-famous Waikiki Beach and a short drive from Honolulu International Airport. The beautiful, newly-renovated guest rooms at Courtyard by Marriott Waikiki Beach feature comforts and amenities that make visitors feel right at home. Guests can email or post pictures using the Oahu Hotel’s super-fast complimentary internet connections, watch movies on flat panel TVs, and get tips from the Concierge about Oahu attractions, Oahu events, Oahu activities, Oahu restaurants, Oahu shopping, and more. Private Balconies and Dreamer Beds with Pillowtop Mattresses assure a relaxing stay. Those planning a visit can browse the Hotel’s Oahu Visitors Guide for information about attractions, activities, dining, and shopping.